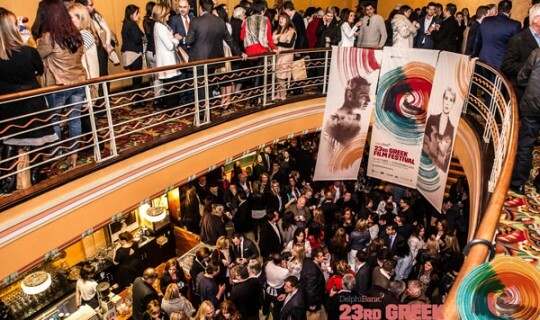 The Delphi Bank 23rd Greek Film Festival had its opening night last night – filling both the Astor Theatre and Palace Cinema Como. This was the first time the event has run across two cinema locations simultaneously and entertained at total of 1200 people, celebrating Greek cinema and culture. The event was officially launched by Ms Marina Hrysoveloni – Deputy Minister of Infrastructure, Transport and Network of the Hellenic Republic, and welcomed other speakers including Ekaterini Xagorari Ambassor to Australia for the Hellenic Republic, Jim Sarris (Head of Delphi Bank) and Bill Papastergiadis (President Greek Community of Melbourne). In her speech, Festival Director Penny Kyprianou mentioned a number of special events being hosted at the Astor Theatre this year including a Summer Lovers 80s party, the Yorgos Lanthimos double-bills and Cloudy Sunday (which includes a performance by Melbourne band Rebetiki) later in November. Gracing the red carpet was Greek actor Yiannis Aivazis (Dream of Shadow), who is in Melbourne for the premiere of the film at the festival. At the party, guests enjoyed food and cocktails by Philip Vakos at his team at Bahari restaurant. The 2016 program runs until 23 October and features a selection of the latest features, documentaries and shorts made in Greece or directed by Greek-Australian filmmakers. Tickets are on sale now from www.greekfilmfestival.com.au.